Through the medium of a cartoon in a Kent newspaper, this week I attempted to solve an ongoing problem that is troubling the good people of the county. Might need a bit of extra public funding, and quite a bit of maintenance, but I reckon it could work! 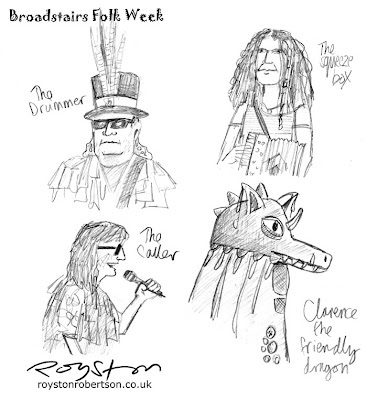 Feels like it was only last week I saw all those folkies - they look remarkably similar to the Sidmouth lot! 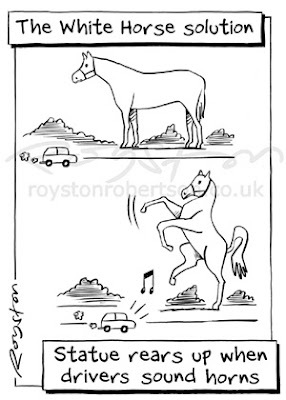 I really liked the idea about keeping everyone happy with the white horse. Reminds me of that Larsen cartoon where the cows stand on two legs, only to drop down when a car approaches! They probably are, these Morris sides do get around. Seems like it's a good way to see lots of different parts of the country ... and to try their beer of course! great gag -- and nice to see some sketchbook work. Thanks, Will. I don't put much sketchbook stuff on here because my sketchbooks are mainly roughs for cartoons, I don't do a great deal of out-and-about sketching. The folk festival is great material though, so I thought I'd have a go.